Captain Miles is a licensed ship's master who has been with the Pride of Baltimore organization since 1981, when he joined as one of three rotating captains on the original Pride of Baltimore. He is a tall ship master with more than 35 years of experience as a professional sailor. His voyages have included five Atlantic Ocean crossings, as well as three Pacific voyages of 5,000 miles, each taking about 25 days. He has traversed the Saint Lawrence Seaway more than a dozen times. Captain Miles holds a USCG 500 Ocean Master License for Power and Sail, as well as numerous other certifications. Prior to joining Pride, Inc., Captain Miles served as master or mate aboard 15 vessels, including Lady Maryland, Californian, Bill of Rights, New Way, Alexandria, Brilliant and Clearwater. Along the way he also helped develop model sailing programs for youth at risk. 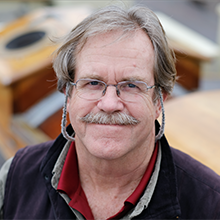 His accomplishments and contributions to the tall ship sailing profession have been recognized both within and outside of the maritime community. In February 2013, Captain Miles was recognized with the Lifetime Achievement Award by Tall Ships America.